From the first coronary artery bypass surgeries to today’s advances in genomics and cell-based therapies, scientific and technological innovations continue to dramatically transform health care. Innovations are also reshaping how care is delivered — for example, through connected devices and home monitoring — and are changing the business side too, with novel financial arrangements such as bundled payments and value-based reimbursement. 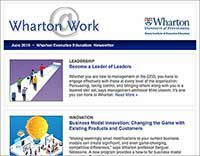 Wharton Executive Education and Penn Medicine — world-renowned leaders in education and pioneers in health care — have designed a program to enable health care executives and clinicians to take the helm on innovation. The program is intended for established and aspiring leaders, both within and outside the U.S., and imparts a strategic, process-oriented approach to innovation that will speed organizations forward in this new era of health care. Health Care Innovation, a program offered by Wharton Executive Education and Penn Medicine, will teach health care leaders how to apply new models of innovation. This program will boost your acumen in managing the innovation activities of any health care organization, whether it is a stand-alone private practice, a large academic medical center, a medical device company, or other type of facility. Moreover, during the program you’ll have the opportunity to network with experts from Wharton and Penn Medicine, and with peers who are passionate about health care innovation. Physicians will receive a maximum of 23 AMA PRA Category 1 Credits™. The Wharton-Penn Medicine Health Care Innovation program offers an unparalleled curriculum that will enhance your ability to strategically manage innovation in your organization. 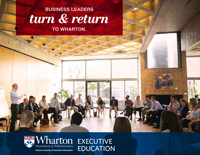 The program delivers a unique blend of lectures, experiential exercises, simulations, small group conversations, and class discussions with Wharton and Penn Medicine faculty as well as with distinguished industry thought leaders. Case Study: Roy Rosin, Penn Medicine’s Chief Innovation Officer, describes an example of a health care innovation. On the first day of the Health Care Innovation program, you and your fellow participants will become engaged in an exciting Innovation Tournament based on a specific clinical challenge. In this competition, new ideas undergo numerous rounds of vetting, and only the strongest and most promising ideas make it to the final round. This type of tournament has been shown to generate remarkable innovation opportunities. The best ideas from the tournament will lay the foundation for group work during the other days of the program. Participants will have the opportunity to directly apply design thinking methodology to action learning projects related to the winning concepts. The learning objectives of Health Care Innovation can be organized into three groups: Design Thinking in Health Care, Managing the Process of Innovation in a Clinical Organization, and Innovation Strategy in Health Care. Physicians: Penn Medicine designates this live activity for a maximum of 23 AMA PRA Category 1 Credits™. Physicians should claim only the credit commensurate with the extent of their participation in the activity. Health Care Innovation is designed for clinicians and health care executives in a variety of settings including large established health care organizations, private practices, and start-up companies both within and outside the U.S. Participants include, but are not limited to, clinicians, scientists, and other administrative and executive leaders who will benefit from learnings and skill development around innovation in health care. The program may be valuable for individuals from multiple disciplines, including physicians, nurses, business executives, psychologists, pharmacists, and medical researchers.